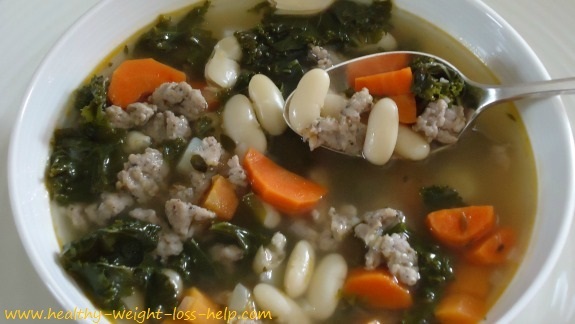 This kale soup recipe makes such a perfect meal this time of year. As the leaves fall so effortlessly from the trees with every chilly breeze to guide them, there seems to be a warmth around the dinner table as the family savors every spoonful of this warm and filling soup. This meal also offers many benefits. It's delicious, high in nutrition yet low in calories, making this a great choice for the whole family. Kale is considered one of the super foods in the vegetable department. It's filled with vitamins, minerals and antioxidants. 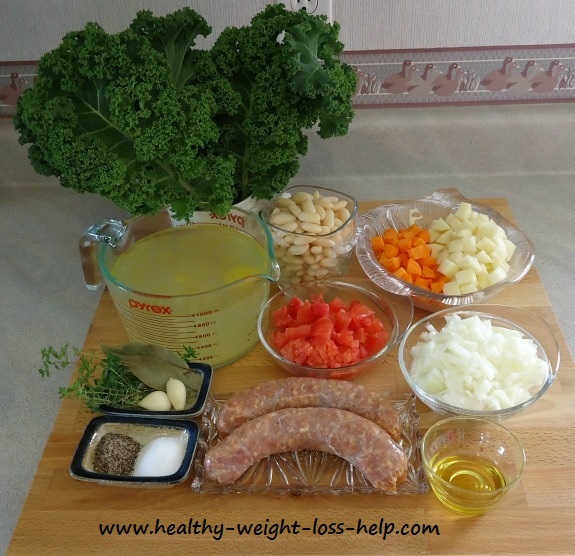 In a large soup pot, heat oil over medium heat and add the sausage. Fry sausage bits for about 8 - 10 minutes. Add onions and sauté another 5 minutes. Then add the minced garlic and continue sautéing for another 2 - 3 minutes. We now add the carrots, potatoes, tomatoes, bay leaves, thyme and season with some salt and pepper and continue to sauté all these ingredients for another 5 minutes. Pour in all the liquid and bring to a boil. Once boiling, add the white beans and kale. Reduce heat and simmer for about 20 - 25 minutes or until vegetables are cooked. Remove from heat and discard bay leaves and thyme. Now's a good time to do a taste test and add more salt and pepper if needed. Calories in each serving is 236 calories. If you don’t have any chicken broth on hand just substitute the broth with water and add about 3 of the small square chicken bouillon cubes. This diet soup is a filling meal all on its own, but many enjoy soups served with crackers, garlic toast, crostinis or some choice of bread on the side. Slices from a baguette which have been brushed with oil and sprinkled with a little salt and pepper that has been baked in the oven until golden brown.